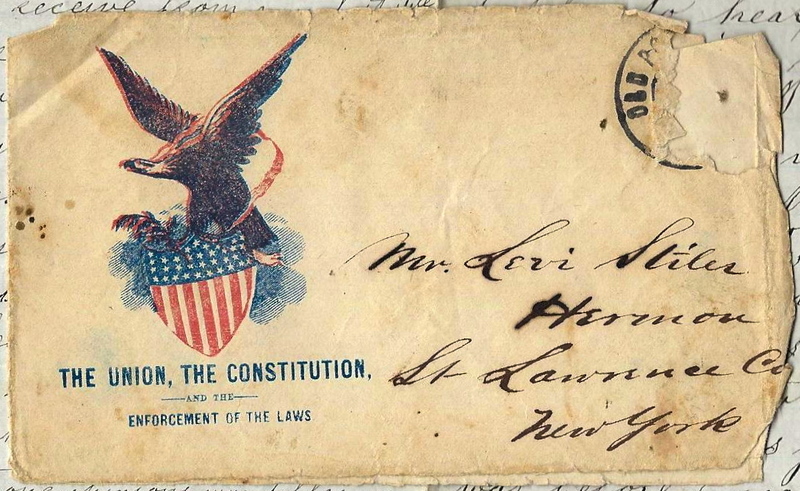 This letter was written by 23 year-old Lewis Walker (1840-1864) of Company K, 142nd New York. Lewis was the son of Samuel M. Walker (1814-1871) and Lucinda (Morris) Walker (1817-1892) of Canton, St. Lawrence County, New York. Lewis enlisted on 4 September 1862 at Canton to serve three years and was mustered in as private at the end of the month. 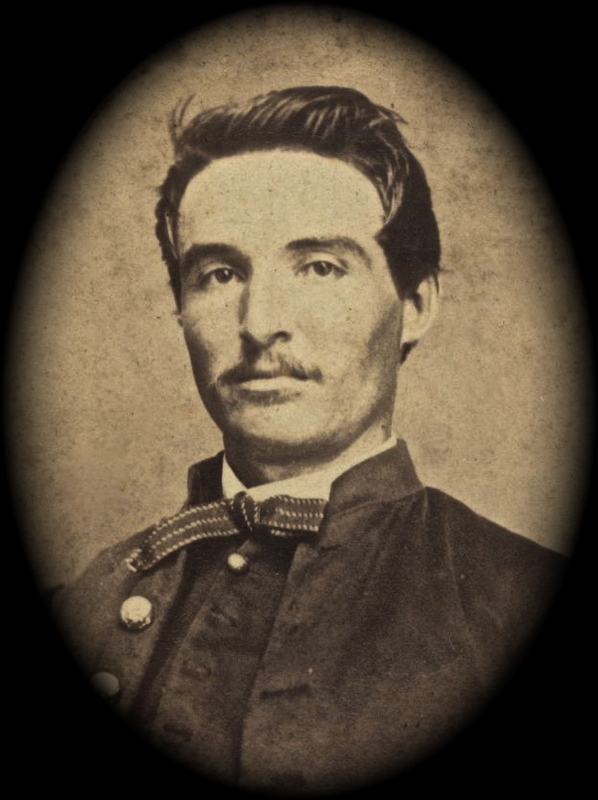 Lewis served with his regiment until 16 June 1864 when he was wounded before Petersburg, Virginia. He died of his wounds on 29 June 1864 at Hampton Hospital, Virginia. He is buried at Hermon Cemetery, St. Lawrence County, New York. Adding a note at the end of this letter, written in the same hand as Walker’s letter, was Leroy K. Copeland (1818-1904) who enlisted as a private in the same company was Walker on 28 August 1862 at the age of 44. Copeland was promoted to Corporal on 1 March 1865 and mustered out with his company on 7 Jun 1865 at Raleigh, North Carolina. Copeland was the son of Ira Copeland (1787-1870) and Olive Sally Bacon (1785-1852). His first wife — Elvira M. Nickerson (1825-1853) — died in 1853 and he was married to his second wife, Julia Ann Nickerson (1829-1904) in 1859. The 142nd New York was ordered to serve in the defenses of Washington D. C. until April 1863, when they were sent into Tidewater Virginia. They participated in the Siege of Suffolk and in June were involved in Dix’s Peninsula Campaign. After being sent north in pursuit of Lee’s army after Gettysburg, the 142nd was sent south in August 1863 to participate in the Siege of Charleston (with attacks on Forts Wagner, Gregg and Sumter) and remained in South Carolina until April 1864. In April 1864, the 142nd was sent to Virginia to serve in Gen Butler’s Army of the James in the Bermuda Hundred campaign, taking part in the battles of Swift Creek, Fort Darling, Drewry’s Bluff and Bermuda Hundred. This regiment then served as part of the XVIII Corps contingent at Cold Harbor. It missed the main assaults in the Battle of Cold Harbor, as its brigade was kept back to guard the landing and supply depot at White House Lounding, but the unit apparently replaced another regiment in the line after the battle and sustained 10 casualties. The 142nd then participated in the Siege of Petersburg, fighting at the Battle of the Crater, Chaffin’s Farm, and Fair Oaks. Lewis addressed the letter to his friend, Levi Stiles (1834-1906) who was married to Emma Eastman (1841-1915) in October 1855. Levi was the son of Sylvanus and Susanna Stiles of De Kalb, St. Lawrence County, New York. I received your kind letter of the 9th inst. by due course of mail and was happy to hear that you had been enjoying yourself so well in your usual winter employment and that you were enjoying good health. My health is very good at present, although I was quite out of health for a while. I was two weeks in the Fairfax Seminary Hospital, but I think my health is as good now as it was before I was sick. Everything is kept in first rate order in this hospital. There has been and is now a good many sick in our regiment, and quite a number have died. We have lost 22 by death. We do not (as you supposed) occupy our old encampment. We have moved twice. The first time, we moved to a place about 3 miles below Alexandria on the Alexandria and Fairfax railroad. We staid there about 4 weeks and then removed to our present camp, which is located near to what is called chain bridge on the Potomac [River] 5 miles above Washington. The bridge here is not a chain bridge now, the place takes its name on account of there being originally a chain bridge across the river at this place; but there is now a bridge of timber placed on stone piers of the strongest of mason work; the bridge is nearly ½ mile long. It was built by the District of Columbia. I received your your letter which you wrote to me last winter and ought to have replied to it, but I was very busy working on a depot building at the time, and was taken sick while at work there. Therefore, I think you will excuse me for the seeming negligence, and I will try in future to be more punctual. But you must not wait for me but write every opportunity you have for it sometimes happens that I have so many duties to perfom that if I can not reply to my friends letters as soon as I could wish. The weather here has been extremely unpleasant for some time till today. It has snowed and rained, freeze and thawed, and the roads are so muddy that it is next to impossible to get about. But today it is quite warm and pleasant. I received a short epistle from you last winter for which I am very thankful and I hope it will not be the last such kind favor that I shall receive from you. But still I would like to have you make your epistles (in future) to fill a sheet (with fine hand writing). 1st with matter of general interest, and 2ndly, with your candid opinion in regard to the course which the Administration has pursued, and the effect which that course has had on the war. Also when and on what conditions this war will terminate. I am aware that our opinions may differ on these questions, yet there will be no impropriety in an exchange of opinions in a friendly manner. My health is very good and has been ever since I was here. I remain (as ever) a firm patriot and am willing to face danger or even death to save the Union, but to be drove into slaughter pens without a prospect of helping said cause, I am not much in favor of.